Actually, now it has two answers…Drybit™ Category 6 and 6A cable. Conduit that originates indoors but passes through or under a concrete slab is often subject to water infiltration. Standard indoor cables can’t be used in these situations since water will have a catastrophic effect on both their electrical performance and physical properties. The typical solution has been to use outdoor cable in the conduit and then transition to the appropriately rated cable type once indoors. 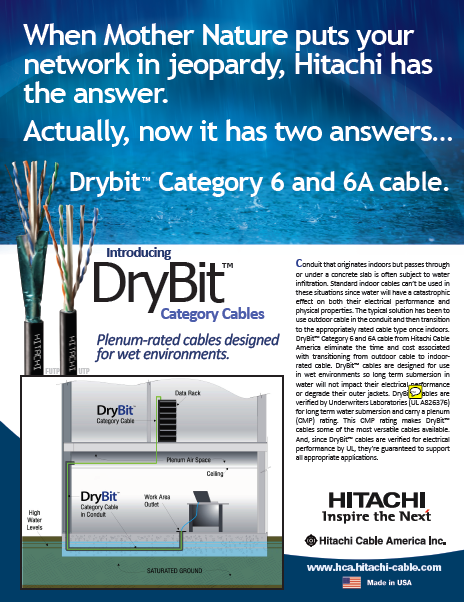 DryBit™ Category 6 and 6A cable from Hitachi Cable America eliminate the time and cost associated with transitioning from outdoor cable to indoor rated cable. DryBit™ cables are designed for use in wet environments so long term submersion in water will not impact their electrical performance or degrade their outer jackets. DryBit™ cables are verified by Underwriters Laboratories (UL A826376) for long term water submersion and carry a plenum (CMP) rating. 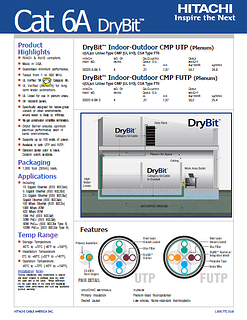 This CMP rating makes DryBit™ cables some of the most versatile cables available. And, since DryBit™ cables are verified for electrical performance by UL, they’re guaranteed to support all appropriate applications.